The recipe for these short ribs is part of a Valentine’s Day ‘Romantic Dinner for Two’. You can see that entire menu HERE. Don’t the short ribs look lovely in the photo alongside the potatoes and shrimp? Surf & Turf! YUMMO! My recipe calls for ‘boneless short ribs’ but you can use ‘bone-in short ribs’ if you can’t find the boneless ones. 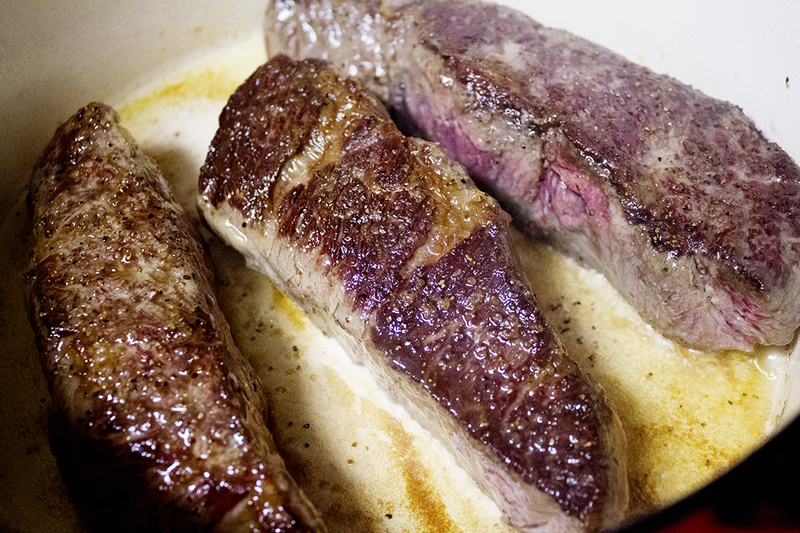 Just be aware that they are more fatty when they are ‘bone-in’ so you’ll probably want to skim some fat off the top of the resulting sauce before you reduce it down and make the gravy. If that extra fat doesn’t bug you… don’t worry about it. 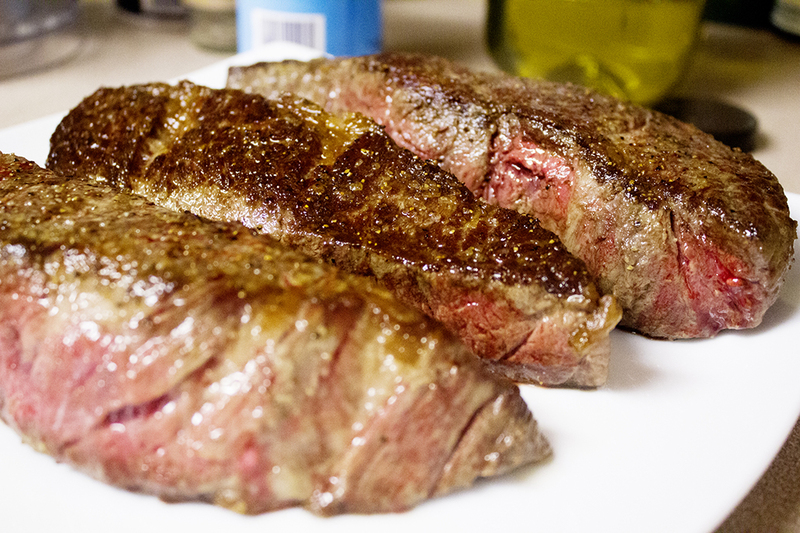 I’ve made the recipe both ways with bone-in short ribs and I’ve made it with boneless version. I really LOVE both. Once you get this dish going it’s hands free and you can get yourself ready, your table set, and the rest of your meal prepped! This post will be less detailed than some posts but I got as many pictures as I could during the process. It was a BUSY time of day for this mama and I barely had time to get the short ribs cooked, let alone photographed. So some of the steps will have to be pictured in your imagination I’m afraid. 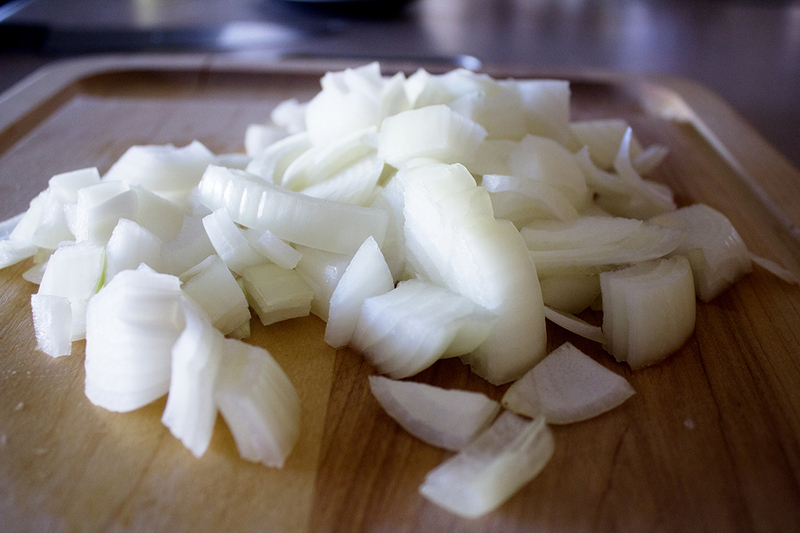 It all starts by chopping up a large, white onion. 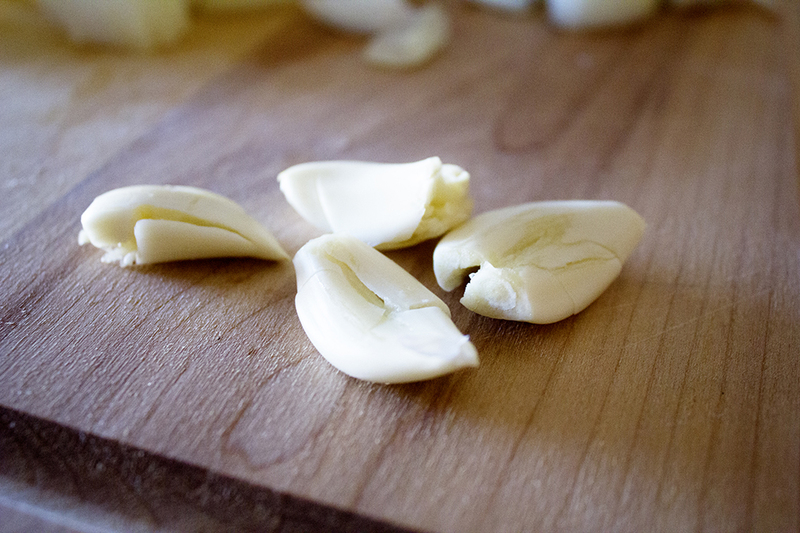 And peeling up and lightly smashing four cloves of garlic. Then you season your short ribs liberally with salt and pepper. And brown them on both sides in a large, heavy-bottomed pot (like a dutch oven) that you’ve heated some olive oil in. Mmmmmm. I can almost smell them now. You move the short ribs to a plate for a bit. You’ll add them back in shortly. Now is where you’ll have to use your imagination for a moment. I know you can do it. 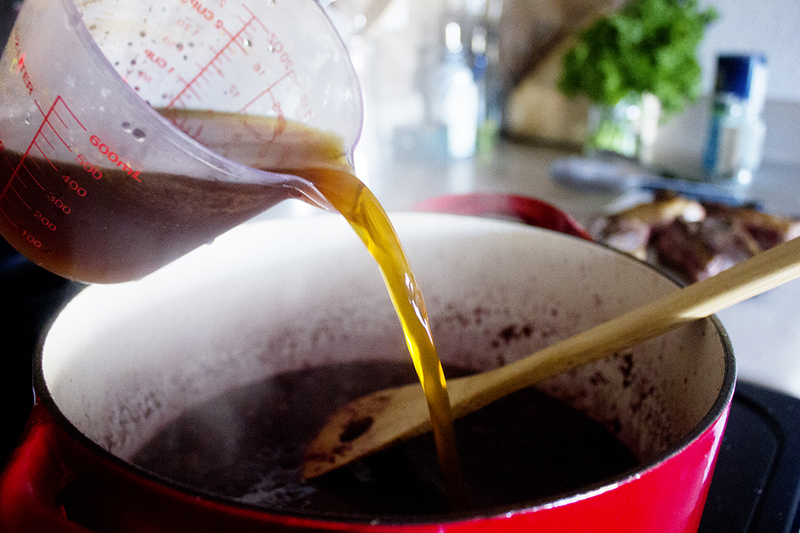 Pour off the excess fat in the pot, then put it back over the heat and drizzle in 1 TBSP of olive oil. Toss in the onions you chopped and the garlic you peeled and smashed. And also toss in 5-6 sprigs of fresh thyme. No need to pull the leaves off or chop them. Just toss them in! Worry-free cooking! You stir this pretty much constantly for a while. You don’t want the garlic to burn! (Trust me. I speak from experience). The onions will get nice and softened and will start to brown. Did you do it? Use your imagination? I knew you could do it. With the pot nice and hot, deglaze the pan by pouring in a whole bottle of red wine (or 3 heaping cups of beef stock if you prefer). Scrape the bottom of the pot with a wooden spoon to get all those wonderful browned bits loosened from the bottom of the pot. 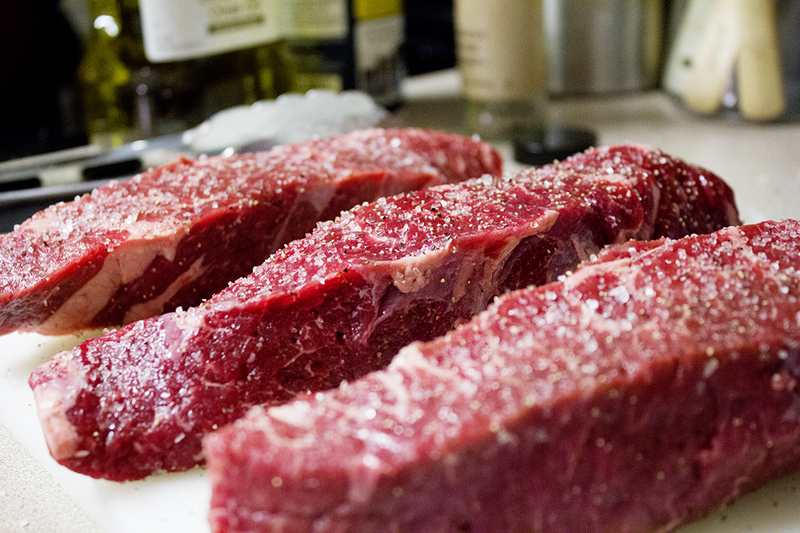 They will give wonderful flavor to your short ribs and your sauce. 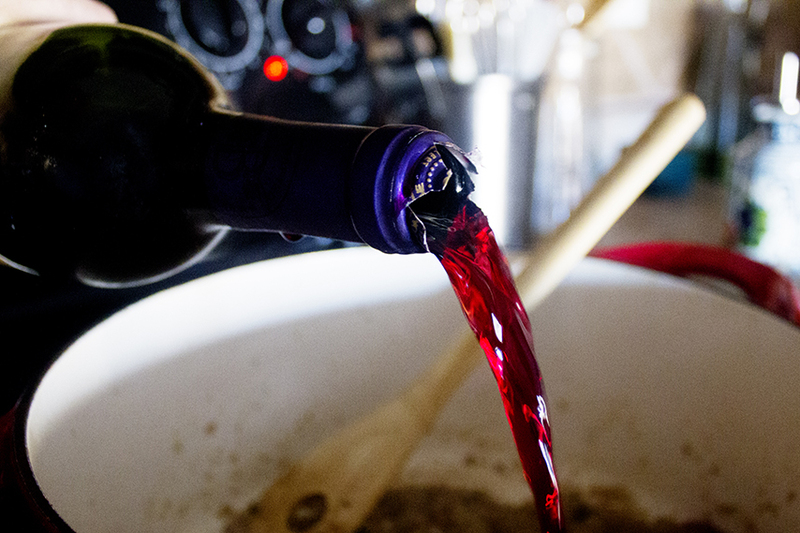 You let the wine reduce until all that’s left is about 1 cup of liquid. Just bring the wine to a boil and then let it bubble over medium heat to let it reduce. Give it a stir every few minutes. 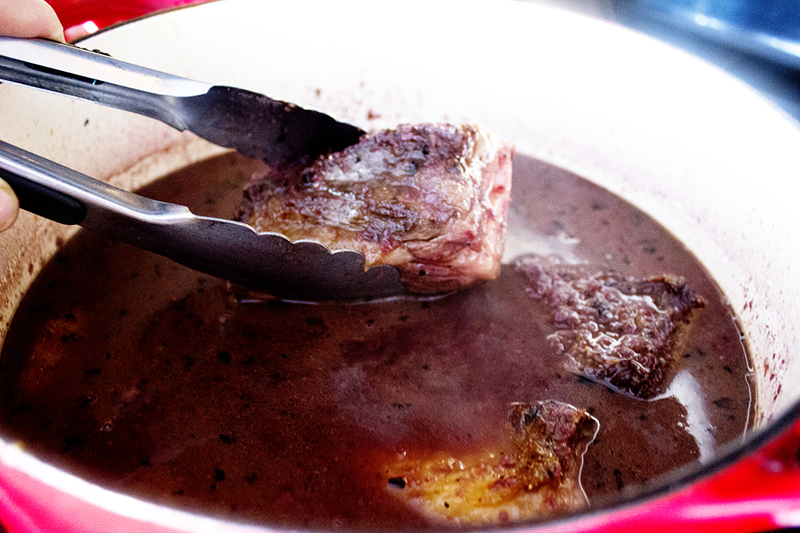 Once the wine is reduced, pour in 4 cups of beef stock. (Yes, you still do this even if you used beef stock instead of the wine for the previous step). Then you nestle your short ribs into the pot. 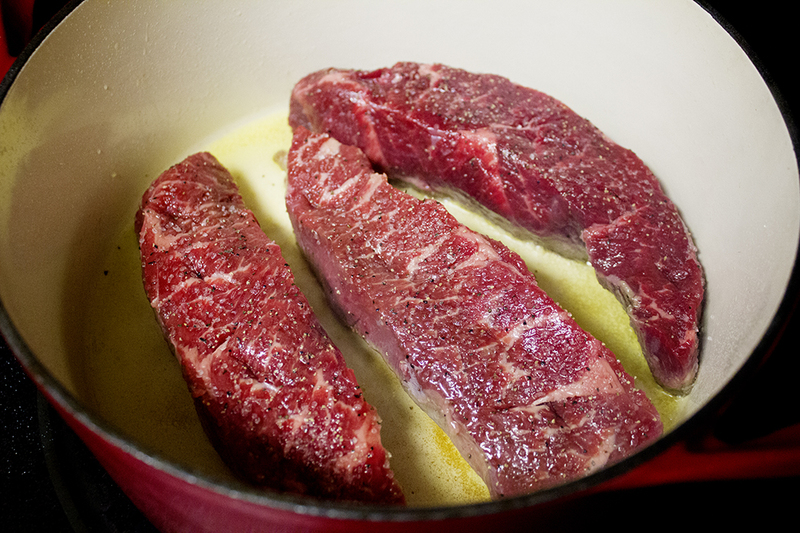 Be sure to add any juices that have collected on the short rib plate back into the pot with the short ribs. This will only add to the flavor of your final outcome! Bring the whole thing to a boil. Then turn off your stovetop, cover the pot, and stick it in a pre-heated 325°F oven. Let the short ribs braise for about 2 1/2 hours until they’re melt-in-your-mouth tender. The final step is to take the short ribs out and finish the sauce. You can read about that in the recipe! It’s decadent. I hope you LOVE it! Click HERE if you want to see the whole ‘Romantic Dinner for Two’ menu.